Byeonsanbando National Park is a 35km stretch encompassing five townships along the coast. Designated as a national park in 1988, it is the only national park in the country that has both a seashore and mountainside. 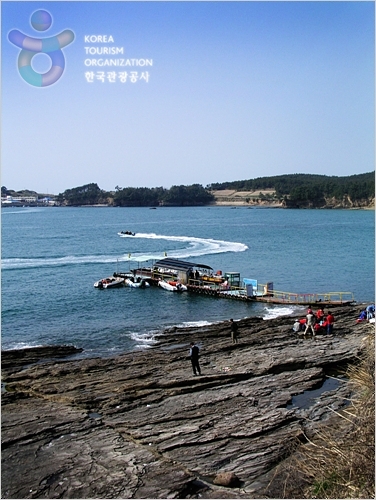 The park is divided into two large sections: the shore area, called Oebyeonsan (Outer Mt. Byeonsan), and an inland area called Naebyeonsan (Inner Mt. Byeonsan). Chaeseokgang Cliffs and Byeonsan Beach are the main tourist attractions of Oebyeonsan. Located to the west of the Byeonsan Peninsula, Chaeseokgang Cliffs includes the rock wall and the sea. The sedimentary rocks formed by the waves over a long time look like piles of hundreds of thousands of books. With its fine sand, Byeonsan Beach is one of the top three beaches on the west coast. The pine forest along the beach attracts the most visitors. There are also many attractions at Naebyeonsan such as Jiksopokpo Waterfall and Gaeamsa Temple. Mt. Naebyeonsan (459m) is especially known for its waterfalls, valleys, and lush woodlands. In Byeonsanbando National Park, there are three famous highlights, collectively referred to as “Sambyeon.” The first is Byeonjae, the long and straight pine trees. The second is Byeonran, the wild orchids. The third is Byeoncheong, the natural honey produced from the slopes of Mt. Byeonsan. It is very fragrant and sometimes used for medicinal purposes. Perhaps the most notable feature of Byeonsanbando National Park is that you can enjoy the sea and the mountains both at the same time. The islands and sunset from the peak of the mountain make for a perfect backdrop. Many people come to see the sunset at Byeonsan Peninsula every year. take an intercity bus to Buan Intercity Bus Terminal.From Buan Terminal, take a bus bound for Gyeokpo (격포). Get off at Geokpo Terminal (격포터미널).